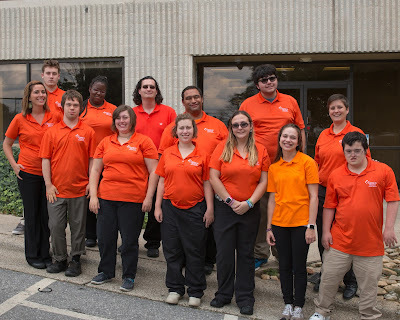 A group of 11 student interns recently began a unique opportunity to explore a variety of career paths as participants in Project SEARCH, a national nonprofit program that creates business-based internships for young adults with intellectual and developmental disabilities. Project SEARCH Asheville is a collaboration between Mission Health, The Arc of North Carolina, AB Tech, Vocational Rehabilitation, Vaya Health, and TEACCH Autism Program. The ARC of North Carolina received the program grant from the N.C. Division of Vocational Rehabilitation Services, and Mission Health and AB Tech are implementing the program. Vaya Health will provide long-term vocational supports for the graduates and is also helping to support the instructors’ pay and other program expenses. Through identified work sites within Mission Hospital, the interns – who are between the ages of 18 and 30 – get an intensive learning experience and total immersion in the workplace on their path to career development and self-sufficiency. Student interns work with a team that includes their family, their Project SEARCH instructor, and a vocational rehabilitation counselor to create an employment goal during this important transition from school to work. The interns begin their day in an hour-long class learning employment skills then move to their internship assignment. At the end of the day, they return to the training room to reflect on their day, discuss any challenges, and evaluate their progress. “Through our collaboration with Mission Health and the ARC of NC, Project SEARCH assists A-B Tech students with disabilities to bridge the gap between education and employment by providing a hands-on, supported training opportunity designed to prepare them for competitive employment. This program is a prime example of community partners coming together to leverage resources and provide these students with the critical skills they need to make their own valuable contribution to the local workforce,” said Karen Pauly, Director, Department of Transitional Studies. Participants gain unique benefits from immersion in host businesses.